When you first get onto Dobbs, things might seem confusing whether you are a veteran Dobber or a new Dobber, since this is a completely new system. However fear not, this little guide should help you get around. 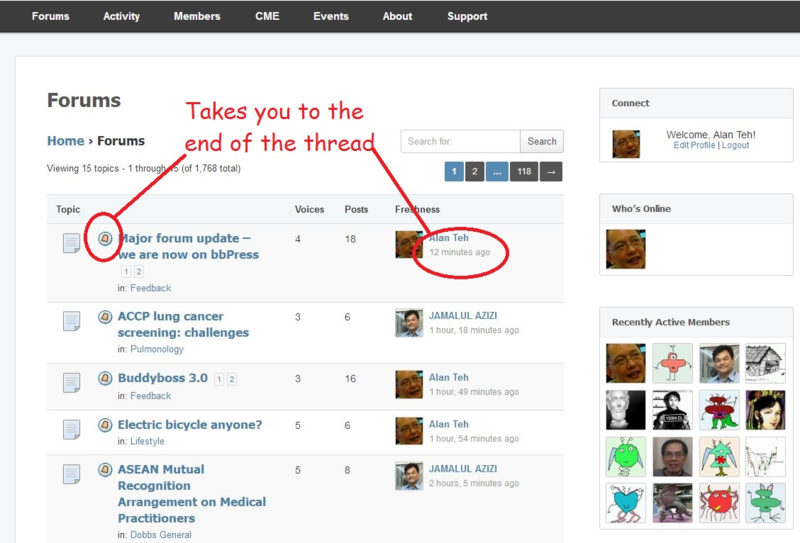 The three key sections are Activity, Groups and Forums and are accessible in the top menu of the page. The Activity stream is very useful if you want to catch up on what is happening in Dobbs. It's like a "What's happening now in Dobbs" page. Click on Activity to see the stream. The default is "Everything" but you can use the drop down box in the upper right to filter according to various activities - e.g. only Updates (Updates are like individual user status updates in Facebook), comments, forum posts etc. You can "Favorite" an activity and it will appear in your Favorites in your profile. Like Facebook, you can also "Like" an activity. While you can Comment on an activity, please note that if the Activity is a Forum post, your Comment will not show up in the forum thread. Comments on activities are not meant for long discussions - use the forums for that. The Groups page lists all the available groups in Dobbs. You can sort by recent activity, membership or ceation using the drop down menu on the upper right (circled in the image above). When you first join Dobbs, you will automatically join Dobbs General, Announcements and Feedback. All the other groups are optional. Each group has a forum and if you reply to a post in any group you will automatically join the group. Joining a group gives you a 25 point bonus in Dobbs. Groups have their own Activity and Forum thread listing which you can access from the Group menu. Please note that Groups labelled as 'Public' means any Dobbs member is free to join or leave the group. All Groups in Dobbs are still exclusive and privately accessible only by Dobbs members who have logged in. Dobbs Groups may be 'Private' if there are Dobbers who wish to have 'by invitation only' Groups within Dobbs for their own discussion purposes. Forums are the main feature of Dobbs. Each Group has one forum but the main Forums page lists all the ongoing posts in all groups. You have an "Unread posts" indicator on the left hand side of the page and this will be Yellow in color if there are unread posts, and White in color if all posts have been read. Clicking on it or the Time stamp will take you to the end of the thread. New: if you would like to view a list of the available Group forums, you can hover your mouse either under the Forums or Groups menu item then click on Group Forums which appears below either.